The Oviedo Heritage, a supplement for The Oviedo Outlook, published on June 30, 1977. This article describes the history of Andrew Duda, Sr., a celery and citrus farmer and early pioneer in Slavia, an unincorporated community southwest of Oviedo, Florida. Duda immigrated from Slovakia to Cleveland, Ohio, in 1909, later settling in Central Florida to try his hand at farming. Initially successful growing Irish potatoes, the market value of the crop could not cover shipping costs and the Duda family struggled financially to survive. Soon after they returned to Cleveland, where Duda and his sons worked in a factory to support the family. By 1926, the Duda family had saved enough money to return to Slavia. This time, their crops prospered and they formed A. Duda and Sons. The family owned company remains in existence today and is an international brand with locations across the globe. Original newspaper article: "Farming Success Came Hard for Andrew Duda and Family." 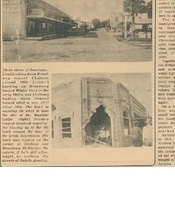 The Oviedo Heritage, June 30, 1977: Oviedo Historical Society, Oviedo, Florida. Digital reproduction of original newspaper article: "Farming Success Came Hard for Andrew Duda and Family." The Oviedo Heritage, June 30, 1977. Barnett, Cynthia. "The Duda Way: A. Duda & Sons Co.." Florida Trend, September 2006. http://www.floridafarmers.org/news/articles/TheDudaWay.htm. "History." Duda Farm Fresh Foods. http://www.dudafresh.com/about/history.php. “Farming Success Came Hard for Andrew Duda and Family.” RICHES of Central Florida accessed April 19, 2019, https://richesmi.cah.ucf.edu/omeka/items/show/5704.